Find hotel near Castello Pallotta (caldar ..
Steeped in history, CASTELLO PALLOTTA boasts of a rich and eventful past. First constructed in the 9th century, this castle was modified considerably in the 16th century, and this brought a distinct Renaissance style to it. 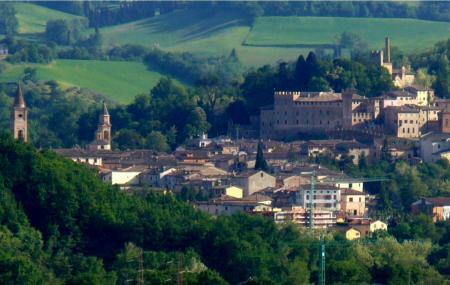 This enormous castle towers over the other structures in Caldarola and can be seen from a distance. This castle has a meritorious list of visitors, and Pope Clement VIII and Queen Christina of Sweden have stayed here. In 1885, Count Desiderio made considerable changes in the layout of the castle and added a number of structures. Due to the earthquake of 1997, the castle suffered enormous losses, but was respaired subsequently. Today, the castle is a place of historical prominence, and history aficionados from all over the world throng to this place to get a glimpse into the ancient world. Create a flawless plan, make use of Caldarola trip planner. Book perfect hotels in Caldarola like Hotel Terme, Albergo Centrale and Hotel Ristorante Tesoro. Generate executable plans on your own or book the top rated Caldarola vacation packages for your visit. Read more on how to reach Caldarola. Disembark at Caldarola (Piazza) Bus Station or Caldarola (Vini Quacquarini). Love this? Explore the entire list of places to visit in Caldarola before you plan your trip. Fancy a good night's sleep after a tiring day? Check out where to stay in Caldarola and book an accommodation of your choice. Castello is (parmenently) closed probably due to earthquake damage. However this isn't mentioned on their website. Suggestivo castello, restaurato varie volte e ottimamente arredato. Purtroppo oggi ancora chiuso a seguito del terremoto del 2016. Prima del citato sisma vi si svolgevano interessanti rievocazioni storiche in costume, come si può vedere dalle foto. STUPENDO.... il visitatore ha come l'impressione di calare in un'atmosfera di altri tempi molto ovattata e molto intima ..il un percorso emozionale di sala in sala di quadro in quadro di oggettistica e varie...non finisce di stupire..e e questo viaggio trova il suo fine nel proprio intimo..